The original hardware and cabling specification for AppleTalk was known as LocalTalk. LocalTalk implementation utilized the Mac’s RS-422 printer port with twisted-pair cabling and 3-pin DIN connectors (right). Systems were daisy-chained together and required adapters to work with the Mac’s onboard DB-9 or 8-pin DIN connectors. LocalTalk provided a fairly speedy 230.4 kbps networking speed, very usable for file sizes and traffic levels of the day – compare this to 56 kbps modem. 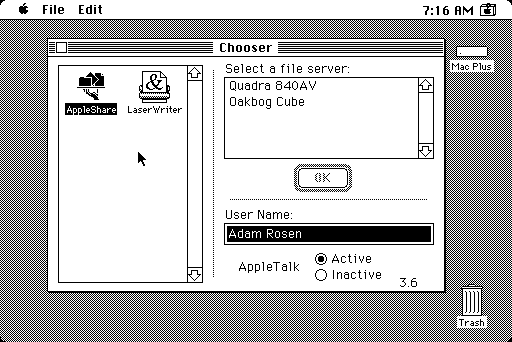 AppleTalk was easy to use: There was no configuration necessary – just enable AppleTalk in the Chooser and look for (or choose) your printer or AppleShare file server. Connected via AppleTalk, the original LaserWriter powered many offices and helped launch the desktop publishing era. As the Mac system software evolved, Chooser extensions were introduced to connect to modems, scanners, third-party printers, and other networked devices. Apple’s proprietary cabling and adapters were expensive. In the mid 1980s, Farallon introduced PhoneNet, which routed AppleTalk traffic across standard 4-wire telephone cabling. The implementation utilized the typically unused outer pair in existing facility wiring. 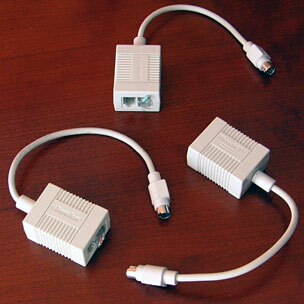 It supported both daisy-chain and star-hub networking configurations, used RJ-11 phone connectors, and required terminating resistors at each end. Handy and cheaper than Apple’s system, without the need to rewire, PhoneNet quickly became the standard for AppleTalk implementation. In the early days, Mac file servers were dedicated computers running AppleShare Server software. System 7 brought Personal File Sharing to the Macintosh, making any Mac a light-duty file server. Once Personal File Sharing was enabled, your whole hard drive or individual folders could be shared across the network. Multiple users were supported, and sharing a folder as write-only created a Drop Box on your network. Implementation could be a bit sluggish, particularly on slower Macs, but this poor-man’s server was a serviceable system. When ethernet was introduced to the Mac, the term EtherTalk was coined to distinguish AppleTalk over ethernet vs. AppleTalk over LocalTalk. That name didn’t stick, but it popularized the term LocalTalk. Over time LocalTalk and PhoneNet have largely become synonymous, though officially LocalTalk utilizes twisted-pair cabling. AppleTalk traffic between LocalTalk/PhoneNet and ethernet networks can be bridged to allow older Macs to communicate with newer systems. Hardware adapters were made by companies such as Asanté and Farallon, and they can still be found on eBay and Craigslist. In 1994 Apple released a free Control Panel, LocalTalk Bridge, which runs on System 7.1 through Mac OS 9 and allows a Mac with both an RS-422 printer port and ethernet to bridge the two networks via software. LocalTalk Bridge gave an extra few years of life to many a Quadra or ethernet-equipped SE/30 after they would otherwise have been retired in favor of newer, flashy Power Macs!